I am back home after a week in New Orleans, Louisiana. Being there reminded me that I can handle freezing temperatures and scorching heat…but not humidity! But aside from the weather, it was nice strolling around and checking out the old city (specially when there was a nice breeze ). I used stamps from the Clearly Besotted Warm Wishes stamp set. It was quite simple. I stamped the cup and saucer image on patterned paper, trimmed it and adhered it to the pool panel. I then embossed the vapor with white embossing powder. Similarly the sentiment is embossed in white on black card stock. OK, even your “simple” cards pack such a large punch! LOVE, love the yellow gingham cup on the diagonal like that. Glad you’re back! It may be simple but it is still eye-catching . Great to have you back – i can’t stand humidity either! 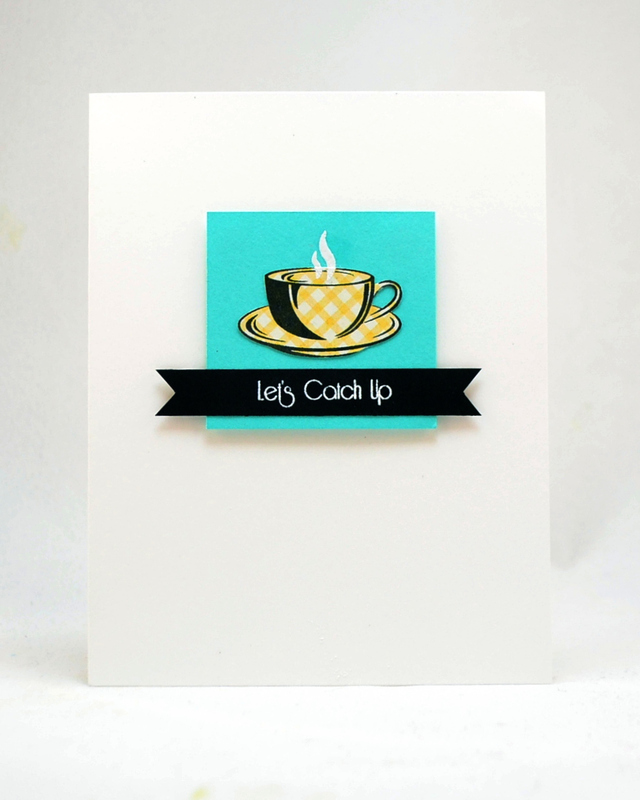 Great card – CAS perfection! This is perfect! I love that adorable tea cup it looks amazing against the aqua background! This couldn’t get any cuter! You are on a Tuesday trigger roll! Uber cute Tasnim, you have triggered this Tuesday perfectly! Just simple and awesome! Love how you interpreted this challenge! You always have the best take on these challenges! Love this clean and simple card! I agree with lizzy, I love your TT cards! This is retro perfection Tasnim!! Perfect, faultless card!! I want to create for this Trigger too but now have cold feet, lol! I love the vivid aqua you have used Tasnim. It gives such a fresh look to your card. Really exquisite. Tasnim, what a BEAUTIFUL take on the TT. Love your design & the bright blue. Ahh! I love this so much! The pattern on that cup is just to die for! Perfection! Winner in my book!